UAVOS has announced the introduction of the company’s new Auto-Tracking Antenna System, a portable ground-to-air antenna designed for incorporation into unmanned aerial systems (UAS). The tracking antenna enables long-range data transmission, and combined with UAVOS’ ground control unit, it significantly increases the quality and range of stable communication transmission. The new Auto-Tracking Antenna System has 2 communication channels with different types of antennas. The first antenna is a telemetry radio link that works at 900 MHz frequency and has a range of 100km+, while the second handles high-speed video communication with a data transfer rate of up to 25 Mbit/s. UAVOS’s Auto-Tracking Antenna System allows for the installation of different modems and antennas, and the turntable system automatically orients the installed antennas towards the UAV. 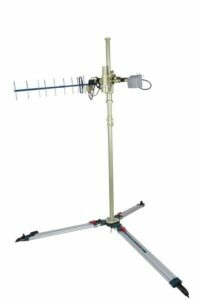 Designed for ease-of-use, quick assembly, and portability, the Auto-Tracking Antenna System can be assembled and deployed in less than 15 minutes. The portable and lightweight design can be completely disassembled, with the main dual-antenna system breaking down into eight individual parts. The entire system fits into most standard-sized SUVs for easy transportation and compact storage.